OSAKA - With the launch of Osaka Ishin no Kai on Saturday, which aims to take control of the Lower House within five years, Osaka Mayor Toru Hashimoto kicked off his latest attempt to build an Osaka-based national political movement. 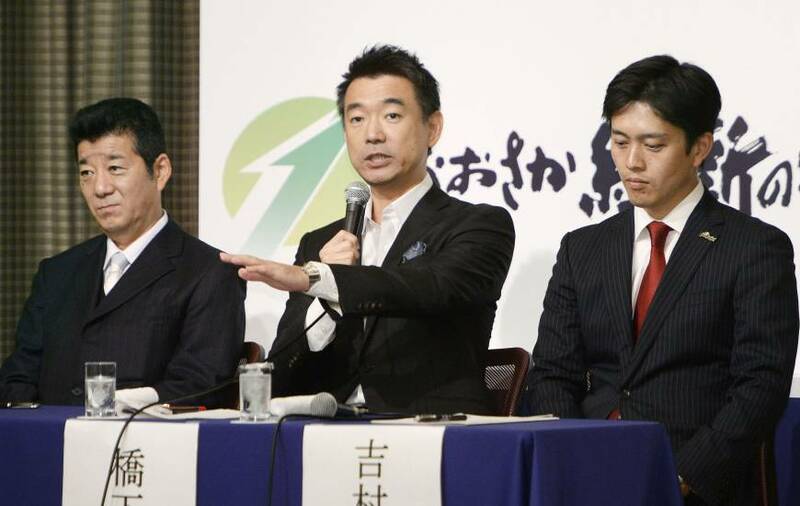 But with mounting legal problems between Hashimoto and his Osaka followers with Ishin no To (Japan Innovation Party, or JIP), the party which Osaka Ishin no Kai members split from, as well as uncertainty over the Nov. 22 Osaka mayoral and gubernatorial campaign, it is unclear how many more Diet members will join the new party before December. 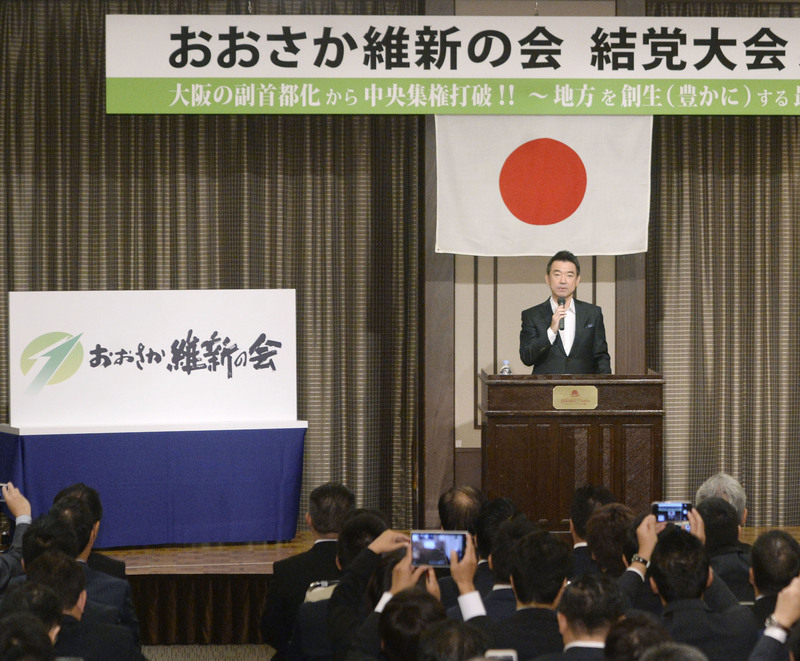 Nineteen Diet members, including one proxy, and dozens of assembly members and supporters from 19 prefectures were in attendance, a total less than Hashimoto had originally hoped for. 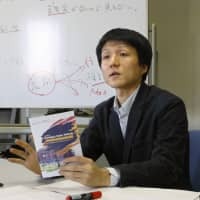 Osaka Ishin no Kai’s policy platform is virtually the same as JIP’s, with an emphasis on smaller government and decentralization, where Osaka would serve as the second capital. 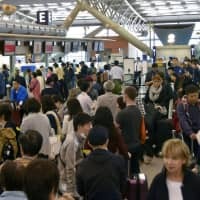 “Tokyo and Osaka should be the twin engines of Japan. The regionalization plans of Prime Minister Shinzo Abe are still, in the end, about centralization of power. 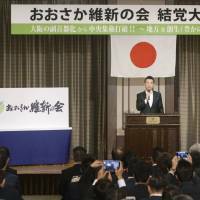 Our new party will push for Japan’s prefectural system to be rearranged into between seven and 11 regional blocks,” Hashimoto said in his opening remarks. On other issues, the new party is expected to be closely allied with Abe, especially on the issue of constitutional revision, which it supports. There is also a pledge to merge the Upper and Lower houses of the Diet and to introduce a system by which the prime minister is directly elected by the people. Other promises include creating a more flexible labor market, which critics warn is an effort by the anti-union Hashimoto to break up unions. There’s also a vague line about encouraging growth through “innovation,” the current trendy buzzword among many corporate, academic and political leaders. The structure of Osaka Ishin no Kai will also be unique among the nation’s political parties. In principle, the top leadership will be selected from only those party members who represent Osaka. Other Diet members outside Osaka will be encouraged to form their own Ishin no Kai groups. All of the non-Osaka groups will be part of a “Nihon Ishin no Kai” political group that will be affiliated with Osaka Ishin no Kai. The party’s exact leadership structure still has to be worked out, but Hashimoto has said he wants to serve as its legal policy adviser after his term as mayor finishes on Nov. 22. While that position is unusual for Japanese political parties, it is common practice in the United States. However, the final leadership structure as well as Hashimoto’s ultimate role hinges on the outcome of the Nov. 22 double election. A loss by incumbent Gov. Ichiro Matsui, Hashimoto’s right-hand man who is expected to play a leading role in Osaka Ishin no Kai, or by Hashimoto-backed mayoral candidate Hirofumi Yoshimura would likely set back efforts to build Osaka Ishin. 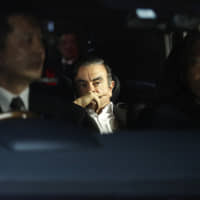 There is also concern over the brewing legal battle between Hashimoto and his followers, and JIP leader Yorihisa Matsuno and the remaining members of JIP. 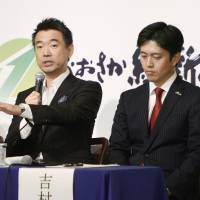 Matsuno has indicated he might file a formal complaint with the Tokyo District Prosecutor’s Office over an Oct. 24 meeting by former JIP members from Osaka who voted to return national funding for the party. Osaka Ishin no Kai still lacks an official English name, but has Osaka written in hiragana. This is, Hashimoto and the mostly Osaka-based membership say, an attempt to convince voters around Japan that, while the party is centered in Osaka, the idea of “Osaka” symbolizes a political philosophy of decentralized, smaller government rather than a physical location.